The idea that movement in magic has significance is of course an old one and can be found in both folk magic and folklore. In witchcraft we see this reflected in the idea of casting a circle and in some forms of modern traditional witchcraft in casting the compass*, and we also find the idea in references to early modern witchcraft which involve the idea of moving directionally around a space either deiseal [clockwise] or tuathail [counterclockwise]. 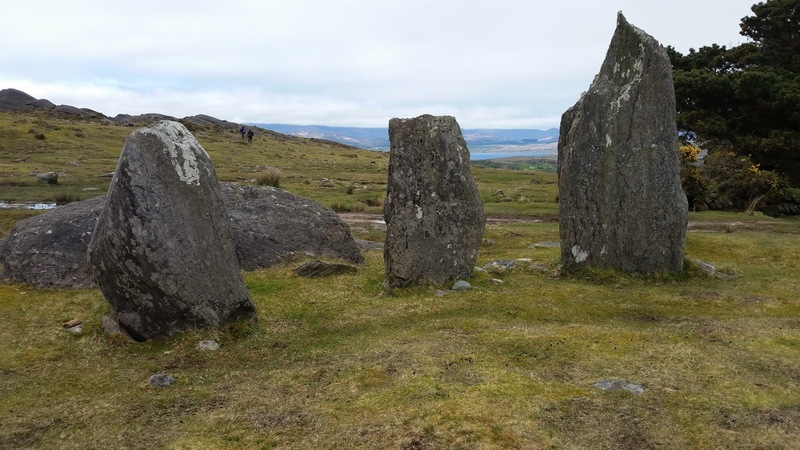 This same idea is reflected in Irish and Scottish folk practices where sacred spaces such as grave yards or holy wells were first circled three times deiseal before being entered. Movement in circles is seen for a variety of purposes, including taking oaths, enchantment, breaking spells, and protective magics (Wimberly, 1928). We see the idea in various ballads and stories of a person circling or moving around a place or person in order to cast magic on them. This idea also exists in folk magic, such as we see in the Carmina Gadelica in Caluinn a Bhuilg 63 where the visiting carolers circle the house three times deiseal to drive out negative spirits and Oidhche Challaig 66 where inhospitably treated singers circle the fire tuathail before reciting a curse on the house (Carmichael, 1900). Wimberly suggests that the references to holy water in these versions are reflections of the later use of milk or water to rescue Tam Lin by bathing or submerging him, and also that it may represent a later Christianization of the pagan practice of using protective circles/compasses. In either view the act seems to secure a level of protection for both the protagonist and later her lover as well by creating a barrier against the Good Folk (Wimberly, 1928). The ballad also suggests that while within this circle the protagonist was invisible to the Fairy Rade passing by, and was only finally seen when she moved to pull her lover down from his horse. In some cases this is referred to as 'right and round' or 'right and around' (Wimberly, 1928). McNeil wrote that all festivals started with the deiseal circumambulation three times of the site or the specific item like bonfire or holy well (McNeill, 1956). Bullán stones are turned deiseal to work cures or for healing prayers and it was once the common practice for holy wells to be circled deiseal before being entered. The concept behind this magic hinges on the idea that moving deiseal, or towards the right hand side or south, is a naturally positive and beneficial direction which follows the motion of the sun. In the Ballad of Childe Rowland the protagonist's sister is taken into Fairy after going around a church widdershins, with the implication that this action opened her up to fairy abduction; in the same way to gain entrance to rescue her the protagonist must walk three times round widdershins himself. "Margarat Davidsone quhan scho sa the new moyne scho ran thrys widdersones about" [Margarat Davidson when she saw the new moon she ran thrice widdershins about] (Crammond, 1903). "Upon the pronouncing of some words, and turning himself about wider-shins, that is turning himself round from the right hand to the left, contrary to the natural course of the sun" (Miller, 1877). 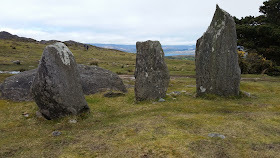 When bullán stones are used for cursing they are turned tuathail and there are some accounts in folklore of stones being held in the hand and turned tuathail to enact hexes as well. "In cureing of his wyfe, be causeing ane grit fyre to be put on, and ane hoill to be maid in the north side of the hous, and ane quik hen to be put furth thairat, at thre seuerall tymes, and tane in at the hous-dur widderschynnes " [In curing his wife, by causing one great fire to be put on, and one hole to be made in the north side of the house, and one quick hen to be put through it, at three separate times, and taken in at the house door widdershins] (Pitcairn, 1833). The exact use of the circle and the choice of direction depended on the situation and purpose as discussed above, but the wider concept is a recurring thread in folklore and folk magic. This idea includes everything from walking fully around a location, object, or person, to turning something like a stone in the hand with the direction of the motion having intrinsic significance to the outcome. We still see these concepts today in neopagan witchcraft, although how close or far from the folk practices the modern practices have grown is debatable. *the concepts of casting a circle or casting a compass are effectively synonymous, and in fact the term 'compas' or 'compasse' in Scots means "a round or ring; a circle or circuit" (DSL, 2018). In practice they also seem to have many similarities, particularly the older versions. *there are roughly two dozen variant spellings for widdershins in Scots. I'm using what I think is the neopagan standard here as the word has passed into some sort of common use through older neopagan texts. Be aware however that in older non-pagan material the word may be found in various spellings including, for example, withershins, wyddyrshins, wouderschinnis.